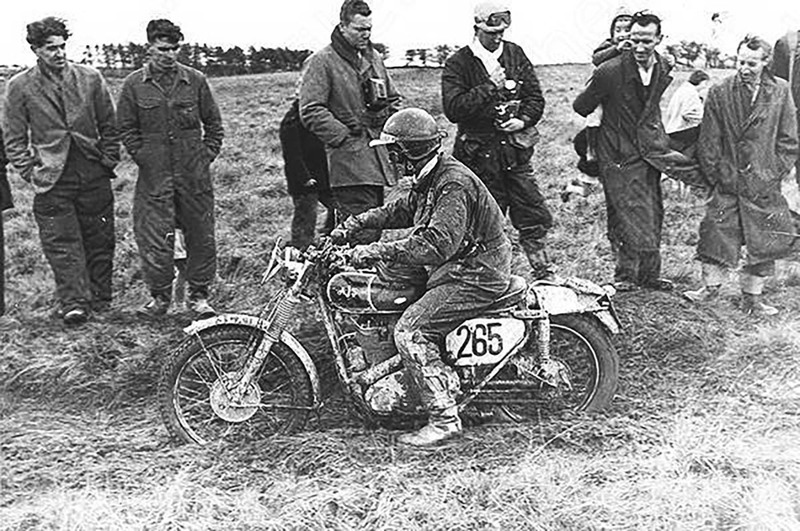 Until the ISDT was rebranded as the International Six Day Enduro and Australia became affiliated with the Federation Internationale de Motorcyclisme (FIM), Aussie riders were obligated to compete under the auspices of the British Auto Cycle Union, which is how Aussie rider Tim Gibbes found himself in their 1961 World Trophy Team; captained by the aptly named Johnny Brittain. A factory rider for the mighty Associated Motor Cycles conglomerate, Gibbes was competing on a 347cc AJS which featured the prototype of an experimental front-brake assembly. The boggy Welsh countryside hardly proved the ideal test venue and Gibbes was quick to realise the front brake was useless. Once water had impregnated the brake drum there was no way for the water to get out. Overnight, Gibbes managed to obtain a heavy duty rasp and, during the 10-minute pre-race work period, filed a slot in the braking plate to release the water. Problem solved. But he’d been spotted by an officious FIM scrutineer who decreed that all tools used by the rider must be carried for the entire event. There are limited places to store a 500mm rasp with any comfort, nonetheless the officials were astounded when Gibbes smashed the file into pieces small enough to stuff into his jacket pocket. Of course the officials then made a point of checking that all the pieces remained in his pocket over the ensuing five days. But an even bigger predicament faced Gibbes when the kickstarter mechanism failed; not usually a problem, other than ISDT regulations stipulated that bikes had to be kickstarted and ridden 20 metres under their own power within 60 seconds of the start signal. Replacing the kick start pawl would be impossible in the morning’s 10-minute work period, so Gibbes disassembled as much as was possible prior to leaving parc fermé at the end of Day Three, then, on a spare AJS, spent much of the night practicing all the steps necessary to complete the task within 10 minutes. No matter where the ISDT was held, local villagers always did their best to assist their countrymen and make life as difficult as possible for the foreigners. And in Wales it was no different as the Welsh considered the English just as foreign as the French or the Czechs; and made a point of obscuring the ISDT course arrows just to enjoy the confusion. Villages with names such as Llyndllyn and Llandlwyn made it easy to become geographically challenged and Gibbes was one of several competitors who strayed. By the time he was back on course he realised he was beyond the three-minute late-time allowance after which penalties apply. As Gibbes approached the section Time Control at undiminished speed he took careful note of the clock positioned on the timekeeper’s bench. Then, in a valiant effort to avoid the official waiting to mark his time card, Gibbes locked the back wheel of the AJS which accidentally slid into the timekeeper’s bench and sent the official clock soaring into an adjacent paddock. Panic morphed into relieved confusion followed by abject apologies. Eventually the official timepiece was recovered, though several minutes had passed and several more passed during the following dispute. That evening the British Trophy Team Manager put Gibbes’s case to the judiciary and while the officials had their suspicions, they couldn’t, in good faith, accurately determine the exact time of Tim’s arrival at the Control and Tim was credited with his due time. And the third of his six Gold Medals in eight attempts.